The movie that could easily have sank Marvel’s efforts to build their comic book characters into legitimate film franchises may very well turn out to be one of their best. Thor had the odds stacked against it from the beginning. Most comic books-turned-movies these days are with a real-world tone, such as with Iron Man and Nolan’s Batman films. A tale about a hammer-wielding Norse god does not immediately fit so easily into this more down-to-Earth approach. One could easily see Thor contrast drastically with Stark’s mix of science and technology and Batman’s gritty Gotham City. However, Thor and Iron Man — among others — are meant to exist in one Marvel film universe which will eventually collide in next year’s Avengers. Thankfully, Marvel has successfully managed to massage Thor in a fashion where it seamlessly weaves in with Iron Man (and presumably Captain America and even The Hulk). Thor is quite smartly told, with fun characters and an intriguing story that serves to introduce Thor to mainstream America, without making him seem silly (as anyone who may only know him through Marvel’s kiddie show, Super Hero Squad). Thor introduces the god of thunder (played by Chris Hemsworth) as an arogant, blood-thirsty brat who grows up to become an arogant, blood-thirsty man. That arogance gets him cast out of Asgard and sent powerless to Earth. There he meets a group of scientists which includes Jane Foster (Natalie Portman), with whom he develops some affection for. But things get dicey when treatury and deceit back at Asgard mean Thor has to learn to become a better man if he hopes to save the day. Director Kenneth Branagh, known mostly for his Shakespeare productions than summer block busters, assembles a thoroughly entertaining adventure. In fact, it’s his experience with The Bard that likely helped shape Thor into such a great film. There are Shakespearean elements to be found virtually everywhere: Tragic romances, royal backstabbing and mystical creatures populate Thor just as they did so many of the playwright’s famous works. Hemsworth does well to keep Thor both bombastic, yet charming. Portman helps make her astrophysicist character more than just a woman in distress, and Kat Dennings keeps Darcy Lewis (the film’s defacto comic-relief) likable. Stellan Skarsgård proves to be one of Thor’s best gems, providing a level to the film which will undoubtedly be used as bread crumbs leading towards Avengers. And Tom Hiddleston is especially oily as Thor’s coniving brother, Loki. Marvel works hard to make Thor’s stand-alone adventure service the greater storyline that will be Avengers, but unlike Iron Man 2, Thor doesn’t feel bloated or distracted. It kick-starts the character, setting him up for whatever sequel films Marvel may choose to produce, while getting its pieces in place for whatever is has in store for the ensemble-dominated Avengers. 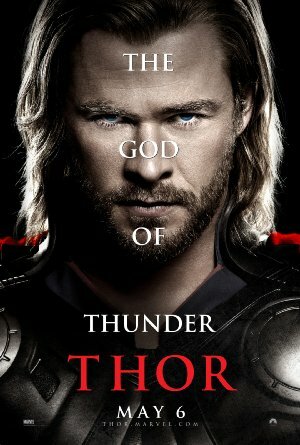 If I was going to say anything negative about Thor, then it would have to be the uninspired 3D. While still fun to watch, if you don’t feel like plucking down the extra few bucks, then keep them in your wallet and go see the 2D version. You’re not going to get anything more out of the experience by seeing it with the added dimension. Somehow, I’m going to bet that this will be true for most of the big budget flicks coming out this summer.